Results day. | An alien voice under a duvet of dreams. Posted by phoenixaeon in A330, ECA, End of A330, OU. Wakey, wakey. Results are out! Argh! Noooo! But yes! But noooooo! As I logged into the OU site I quietly whispered ‘please’ over and over. I shut my eyes as the page flicked from the log in screen to the course webpage on the iPhone. I slowly unscrunched (I don’t care if it’s a word, that’s what I did!) my eyes to peek at the pages as I anxiously scrolled down to the result. And there it was in all its glorious redness! I had done it, despite the crappy ‘adequate’ argument! Completely relieved, I jumped on the chuffing mintball train, and received a big hug from Princi in celebration! I still can’t quite believe it, nor the fact that I have more or less guaranteed myself a first class honours degree with that result! 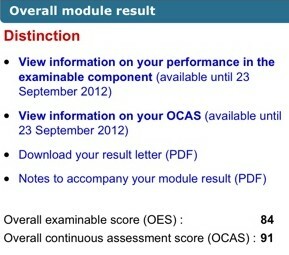 I had never imagined that was even attainable when I began with the OU, my biggest dream was of achieving a 2:1. But with this distinction and the distinction from the Children’s Literature course… WOOHOO! So now I’m off to eat some chocolate cake. Nom! Hooray! You so deserve it! Is this the one where you did the Buffy assignment? Can you put that up on the blog now, I’d love to read it. Anyway, congratulations! Only one more year left – is that right? Have you thought about what you’ll do when you get the degree? Masters? PHD? Write a book maybe? Thank you 😀 Yes, this was the Buffy essay. I’ll send it to you, if you want. I know that it’s a little kerfuddled, I hadn’t fully processed my argument before sending it. Yep, one year left. And maybe I’ll go on to do an MA in children’s literature. I don’t feel that I’m done with that yet! Yeah send it, I’m sure it’s a very interesting read 😀 I’ve been having a few problems opening my emails recently. Probably down to having an old slow computer. So if you could put it up on the blog, even better. I’m just about to do some writing. Still on the same book, but hopefully making (slow) progress. I keep changing my mind about things and then creating extra work for myself. Hopefully I’ll have it finished by the end of 2012 though. By the way, I notice you’ve read The Hunger Games trilogy. What did you think? I wasn’t overly impressed myself. Started OK, then got progressively worse, I thought. I’ve just started reading Necroscope by Brian Lumley. I remember you mentioning it a while ago. Not far into it yet though. Ah, Necroscope. Possibly my favourite series of books, though I still have a few of them to read – new ones that have been out in the last five or so years. As for The Hunger Games, I enjoyed it but really hated Katniss. I also read the trilogy over three days, something that I’ve never done before, so I didn’t give myself a chance to dislike it. So yeah, I did like it, but it will never be one of my all-time favourites. At the moment I’m jumping between Mary Poppins (P. L. Travers) and Ella Minnow Pea (Mark Dunn). As for the essay, I’d prefer to send it over rather than blog it. So you best crank your old, slow machine up ready to do some work! Enjoy that cake Girl, you deserve every last crumb. Hey there, lovely lady! Thank you! How are you and the little’un?